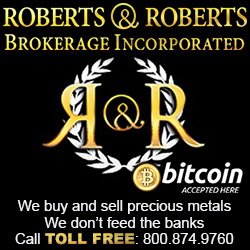 Disclaimer: this article is provided for educational purposes only. Always call a trained emergency medical professional for a life threatening injury. The definition of bleeding is the escape or loss of blood from the human body. There are several types of blood vessels that can bleed and should be understood before we begin controlling it. These blood vessels include arteries, veins and capillaries. Arteries carry blood away from the heart. When arteries become wounded they will spurt bright red blood. Veins are blood vessels that bring blood back to the heart and drain blood from organs and limbs. This will be observed as a dark red and slow, continuous flow. Capillaries are the smallest of blood vessels. They serve to distribute oxygenated blood from arteries to the tissues of the body and to feed deoxygenated blood from the tissues back into the veins. 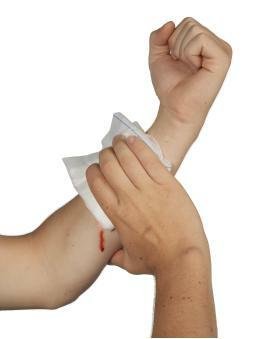 This type of bleeding is similar to road rash, an area where several layers of skin has been removed. There are certain precautions that are recommended to an individual treating a patient that is bleeding. First is scene safety; make sure you are clear of danger before helping the patient, otherwise the responder could wind up being a patient themselves. This is all about situational awareness and being hyper vigilant in your observation of your environment. Second is body substance isolation. 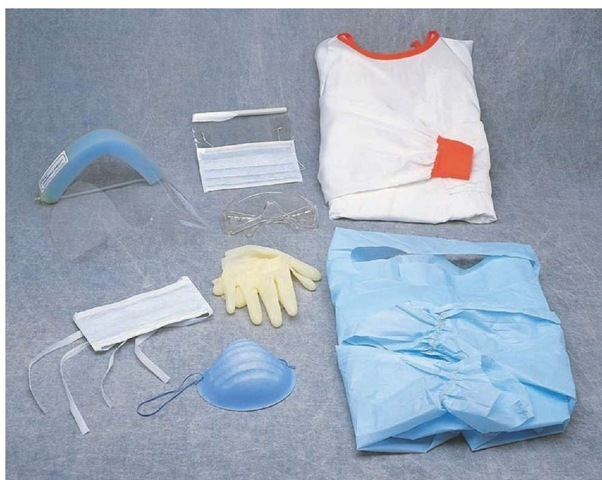 Before treating a patient utilize your Body Substance Isolation (BSI) gear. Body Substance Isolation- pretty much means keeping you safe from the patient as well as keeping the patient safe from you in relation to bodily fluids. BSI gear includes medical gloves, face shield, safety glassese, hospital gowns, shoe covers, surgical mask, or N95 respirator. Bleeding control can be summarized by the acronym D.E.P.T. or department; The Bleeding D.E.P.T. The acronym tells the medical personnel the order of operation to control bleeding. First, direct pressure. 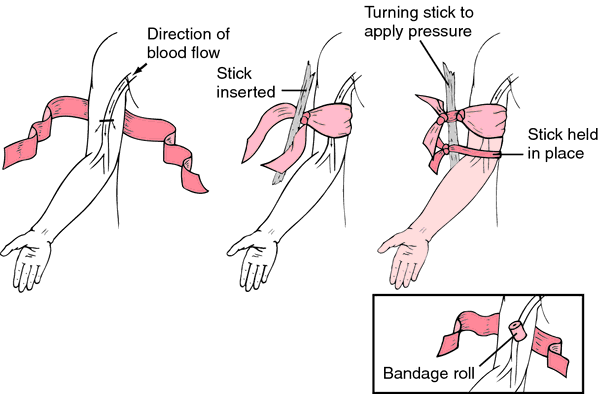 With your BSI on and using a sterile gauze pad, put direct pressure on the wound. If the blood soaks through the gauze pad you will apply another sterile pad on top of the first one and continue to apply pressure. You WILL NOT remove the first piece of gauze. Removing the first gauze pad can remove the platelets in the blood that were working on clotting and stopping the bleeding. Second, elevation. Elevate the wound above the heart while you maintain pressure. The blood will have to work against gravity, slowing the blood flow to the wound. Third, pressure point. In situations where direct pressure and elevation are proving ineffective, there are pressure points. There are several places on the body where arteries are located. These are the places where you will find pressure points. Lastly, tourniquet. A tourniquet will be applied to an arm or leg above the wound and then tightened until the bleeding ceases. This technique is a highly debated method and there are many variables in the debate with when to utilize a tourniquet. You can find out more about the complications and preventive measures of the tourniquet HERE. 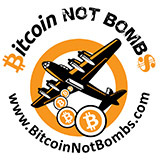 I hope this lesson has been helpful and educational. 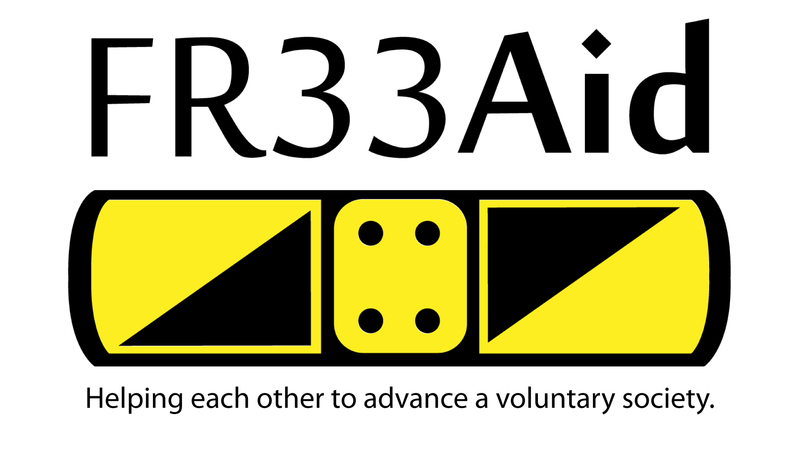 If you want to support Fr33 Aid please donate to keep our efforts moving forward.